Norway. Darkness. Fancy and desperation - this is already a standard. The extreme Norwegian scene looks about the boys from OVERTHROW. The first impression that serves us is the playing manner of the guitar players, which is a high doses black metal. The breathless vocals however are extremely performed in a metal-core approach. In some of the tracks (3, 6, 10) contemporary rock motives are implemented as if inspired by modern bands from the charts. This does not soften the aggression of their music, but makes the style amorphous and non-focused. 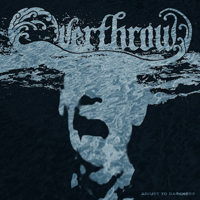 Many people in their country put great expectations for the development of OVERTHROW. I do not hear something that could lead me to such a thought in the debut album of the band. An uncontrolled engorgement of models from the world scene does not approach the boys to their own face as a band. The universal darkness is not inspiring enough to create significant metal. “Adjust to Darkness”does not load up when listening. The songs are short and direct in a punk manner. The 60 percent black metal that are close to the music of NECROMANTHEON would not charm the black metal audience. Their messiness fits the seeking of the youth but I cannot find the grain of genius that could turn the aggression to art.